We have developed a method for plastid transformation in eggplant (Solanum melongena L.), a solanaceous plant species. Plastid transformation in eggplant was achieved by bombardment of green stem segments with pPRV111A plastid expression vector carrying the aadA gene encoding aminoglycoside 3′′-adenylyltransferase. Biolistic delivery of the pPRV111A plasmid yielded transplastomic plants at a frequency of two per 21 bombarded plates containing 25 stem explants each. Integration of the aadA gene in the plastome was verified by PCR analysis and also by Southern blotting using 16S rDNA (targeting sequence) and the aadA gene as a probe. Transplastomic expression of the aadA gene was verified by RT-PCR. 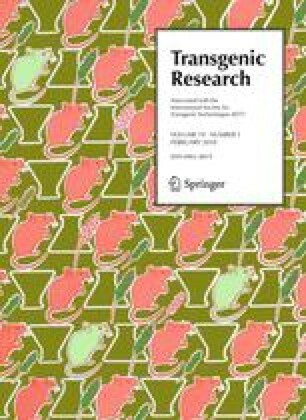 The development of transplastomic technology in eggplant may open up exciting possibilities for novel gene introduction and expression in the engineered plastome for agronomic or pharmaceutical traits. The online version of this article (doi: 10.1007/s11248-009-9290-z) contains supplementary material, which is available to authorized users. We would like to thank Dr. Pal Maliga, Waksman Institute, Rutgers University, USA for providing pPRV111A plasmid. We are also grateful to Dr. Randy D. Dinkins, ARS Forage-Animal Production Research Unit, USDA, University of Kentucky, Lexington, USA for critical reading of the manuscript. This work was supported by a grant (9/83(149)2K2/EMR-I) from the Council of Scientific and Industrial Research, New Delhi, India.